Newts are cold blooded amphibians and typically live around ponds, rivers and streams. They thrive in North America and depending on the species, may live in the water or on land close to moisture. In general, newts are not a problem but in some cases, they can invade homes be annoying. Especially when they start nesting on or in your home. We have several species of newts here in the United States. 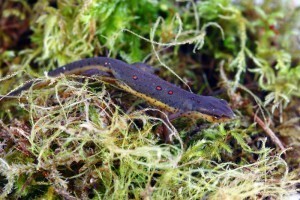 The alpine and smooth newts are found in many states but overall, the eastern newt is the most popular. Newts typically have two tone bodies, colored spots and appear “slimy”. When held they’ll feel cold and clammy; newts need a lot of moisture to live and breed. Newts will lay eggs in ponds, lakes and streams. Like frogs, they’ll develop throughout the warm seasons with adults looking like the newt pictured to the right. Newts feed on a wide range of insects and some plant life. They will forage on land and water and in general, don’t pose a a hazard or threat to man. But on occasion, they’ll conflict with people when they nest around homes. This can happen when there is enough moisture present to keep them happy. Newts like moisture so homes with septic tanks, french drains or high water tables can harbor a newt population. Heavy irrigation – especially in regions where water is scarce – will attract newts. Once in the yard, they can nest under mulch, pine straw, wood chips, cracked foundations, under slabs and in crawl spaces. Around the home they’ll be seen around dark foraging for food. Newts don’t like light and will avoid direct sunlight. On the house they’ll seek dark, shady areas. But once on the home, the problem will usually escalate until they make it inside. Newts generally won’t want to stay or live inside homes; its almost too dry for them to survive. But if you have cracks, gaps and routes of entry leading to living areas, newts will find their way in. A good way to help keep newts, lizards and other pests out of the yard is to reduce insect populations. This is easy to do and spraying with CYONARA RTS around the homes exterior once every 1-2 will do a great job of maintaining a pest free yard. Newts come around because they believe there is a good food supply on your property. For this reason, a good yard treatment will many times make them leave. Cyonara is easy to use and works on all the basic newt food (but it won’t do anything to newts directly since they’re not an insect). To spray, simply hook it to your garden hose and turn on your water spigot. Cyonara treatments will last 2-4 weeks; expect to spray 2-3 times a season to keep things under control. One jug will cover up to 1/2 acre. Next, wait one day after spraying Cyonara and then apply newt repellent. The best repellent is made from all natural, low impact food grade actives. But since newts don’t mind garlic, capsaicin and other plant oils, PEST RID GRANULES will make them want to leave where its applied. So to chase them away from the home and yard, first apply granules to the ground around the home where you’ve seen them active or think they might be nesting. This is usually somewhere damp like pine straw or wood chip mulch areas. Common areas to treat include flower beds, mulch islands, pine straw and any place you’ve seen newts active on the ground. Pest Rid Granules comes in a 2 lb jar and one jar will cover up to 500 sq/ft. You’ll need to use it once a month when newts are active; once every 3 months to make sure they don’t come back once they’re gone. Next, spray over the top with PEST RID SPRAY. Be sure to spray the sides of the home too, especially behind gutters, downspouts, window shutters, electric boxes and other areas you know newts like to hide. Pest Rid liquid will be absorbed by the Pest Rid Granules making the treatment twice as strong and longer lasting so be sure to spray all the granules you applied. Pest Rid spray will last 30 days and should be applied once a month when newts are active; every 3 months to make sure they don’t return. Lastly, if you have newts in the home, set out some insect scented NEWT GLUE TRAPS. 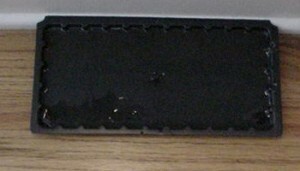 These should be placed along baseboards, under furniture, on countertops or any place where you’ve seen newts foraging. These traps are very effective at catching and holding most common nuisance newts and lizards. 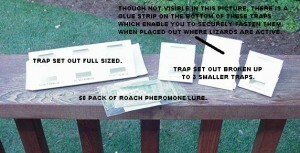 The insect pheromones used to attract newts are in the form of small pills which are simply dropped onto the glue trap. Undetectable by people but quickly found by foraging newts, these boards can be used to trap out local populations without having to spray. But they’re only good for use inside. Use 1 trap every 10 feet where possible; replace every 3 months or sooner if they get filled with newts. If you need an outside trap where its wet, get the PLASTIC TRAY GLUE TRAPS. These will withstand light moisture and are ideal for areas like sheds, garages, patio’s and decks. Newts are generally harmless and like to be left alone. But once they start living around your home they can become a pest. Reducing local insect populations will help keep newts away. So if you’re seeing newts around the yard, treat foundations and landscape with Cyonara to take away their food. Next apply Pest Rid repellent. In most cases, this combination of sprays will chase lizards away and keep them off your property.